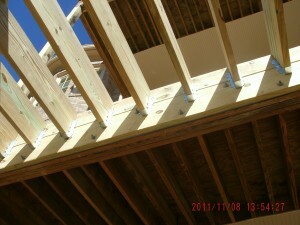 A raised solid deck is a second or third story deck where the decking is solid, such as it being tile, stone or brick. The deck will have a membrane under the solid floor and underneath the deck it is waterproof normally with a finished ceiling. The problem we see is the contractor or installer does not install the membrane properly and the deck starts to leak and the wood rots under the flooring and above the ceiling. This is a good example of a improperly installed membrane. This chimney was improperly constructed, and was not supported correctly on the roof of the house. We have been engaged to place supports under the chimney that were designed by a Professional Engineer. With this project, the homeowner wanted to build an addition to the deck behind the house. However, we found a serious problem here – the rim beams that were supporting the decks on the rear of the house were grossly undersized. This not only presented a serious deflection problem, but a life safety issue also. To solve this problem, we engaged a structural engineer (Runkle Consulting, Inc.) to examine the situation. The repair was to turn the rim beams into “flitch beams”, which are steel plates sandwiched inside timber 2x’s. There is a steel plate sandwiched in the 2x's.